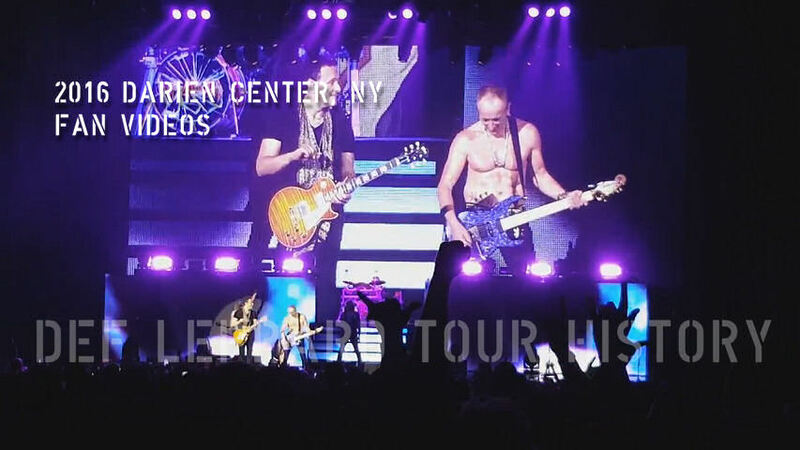 Def Leppard played a 2016 Summer Tour show last night in Darien Center, NY with 17 songs performed. The show took place at the 21,800 capacity Darien Lake Performing Arts Center. The last show of the second leg of the 2016 summer tour. The band's first time in Darien Center since 12th July 2015 on the 2015 world tour. The 15th show the band have played in Darien Center or Buffalo and 10th time at this venue. The first visit to Buffalo took place in July 1980 at Memorial Auditorium as support to Ted Nugent. They returned in 1981 with Blackfoot on the High 'n' Dry tour. The first headline show in Buffalo took place in June 1983 during the Pyromania tour. The February 1988 In The Round show on the Hysteria tour saw them play 'Love And Affection' for the first time ever in the USA and one of only a handful of times on the main 1987/1988 tour. Their last performance in Buffalo. A second n The Round show at the same venue took place in March 1883 on the Adrenalize tour. The first of their ten shows in Darien Center (37miles outside of Buffalo) followed on the same tour in August 1993. Further shows here took place in 1996, 2000, 2006, 2009, 2011 and 2014. The 2015 show was attended by members of Collective Soul and saw Sav wear a 'Kelly Tough' T-Shirt. The idea for that T-Shirt inspired a fan to make Campbell Tough T-Shirts, which were sold to help raise funds for American cancer charities and as a sign of support for Vivian Campbell. Phil and Debbi Blackwell-Cook performed with Tesla for a fourth time. Phil attended a show by UK singer Seal on 30th August at the Hard Rock Rocksino Northfield Park in Northfield, OH before travelling to Darien Center. The venue posted a photo of them together on Instagram. Rick met up with a local fan before the show. An 8 year old girl named Safyre Terry who had been badly injured in an arson attack fire last year. - See photo and linked story below. "Thank you. Thank you very much. And good evening Darien Lake, New York!. How we doing out there?. How we doing?. Let's have a look at you. This the last night of our East Coast run. So let's have a good one shall we. What are you gonna get tonight?. You're gonna get a bit of everything tonight. You're gonna get some old. You're gonna get some new. You're even gonna get some borrowed. But we can promise you nothing blue. 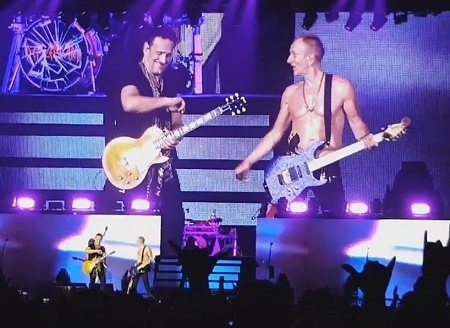 "This is Phil Collen everybody. Here to intro a track from our latest album. This one's called Dangerous." "Thank you. Thank you very much. Look at this place. Oh yeah. As I - as I said earlier on in the evening. This is the last show of our East Coast run. We've seen some familiar faces tonight. That have been to one or two shows in the last month or so. Some people who've been coming for years. We appreciate it. Let's hope that we can keep doing this for many more years 'cause this is fun/ No matter what anybody tells ya. This is fun." "But of course as you know if you've followed this band for long enough. You'll know that throughout a career over time stuff happens to a band. We've taken some hits in there but we have a spirit within ourselves that just brings it back. You guys are 99 per cent of the reason why. But that spirit. Nobody epitomises it more than this guy at the back. Stand up Rick Allen!. And as always, he will introduce this one for ya." "Darien Lake, New York or wherever you have travelled from to be here tonight. We thank you. We'll see you next time. Goodnight!." The next show takes place on 14th September in Billings, MT following a two week break. Played for the first time in Darien Center.